Emulated versions of classic Sega Mega Drive/Genesis games. As of April 28, 2016 the collection now features Steam Workshop support. Original individual volume releases. Europe only. Missing Eternal Champions, Shadow Dancer and Pack 5. 2011 Gold Edition release. StarForce 5.70.021.004 DRM for at least the European versions, missing Eternal Champions, Shadow Dancer and Pack 5. All digital versions require Steam DRM; DRM-free versions are no longer sold. Games are sold on Steam individually or in smaller bundles. The Steam version includes both the "Hub" launcher with the "Simple" launcher as a fallback. All non-Steam versions only includes the "Simple" launcher. The Sega Mega Drive and Genesis Classics package on Steam also includes Sonic CD, however Sonic CD runs natively (without emulation) and does not use the launcher. For the Steam version, uncompressed ROMs of the purchased games can be found under <path-to-game>\uncompressed ROMs. Copy the contents of <path-to-game>\uncompressed ROMs and paste to another emulator's ROM folder of your choice. Rename *.68K and *.SGD file extensions to *.bin so that other emulators will correctly recognize and run them. Workshop mods are *.bin files inside folders found in steamapps\workshop\content\34270. External emulators can load these Workshop mods, copy the contents of 32470 to your chosen ROM folder, and rename the *.bin filenames as you see fit to prevent future confusion, then load them with your emulator. Download the Sega Classics script (further down the page). Run QuickBMS and choose the Sega Classics script. Choose the installation folder containing the *.pak files. Choose the folder to save extracted ROMs to. QuickBMS will now extract the ROMs. Press ↵ Enter when done to exit QuickBMS. Windows locations are for the "simple" interface; Steam location is for the "hub" interface. Each game is saved in a separate folder; refer to the pak to game list (pastebin mirror) for each game's number. The "Simple" launcher uses either folder depending on region; the "hub" launcher only uses the "Mega Drive" path. Launcher general settings (for the "Hub" launcher). Launcher general settings (for the "Simple" launcher). Hub room supports widescreen but games are 4:3. Use 3D Vision Fix for more scaling and resolution features. Use the -popupwindow command line argument for the "Hub" version. Launcher control settings (for the "hub" launcher). Launcher control settings (for the "Simple" launcher). 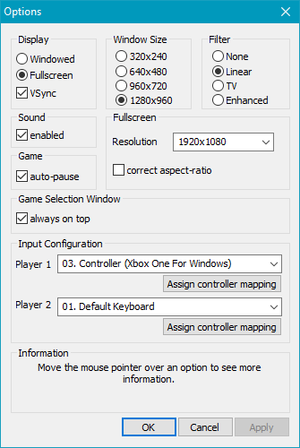 No mouse support outside of main interface. Only for "hub" launcher. Mouse needed to use "simple" launcher. Left to individual games. Both relevant games implement it. Xbox button prompts in launcher. 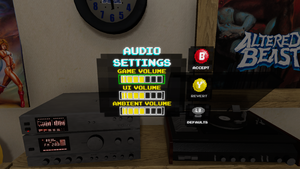 Controller specific buttons are shown in rebinding menu, but are bound to Xbox prompts. 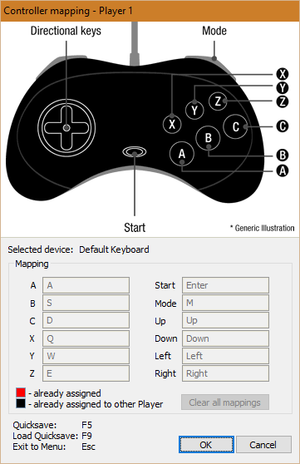 Any button prompts available in game are for the Mega Drive/Genesis gamepad. Requires game to support local play. See Unity engine. Might have some problems. 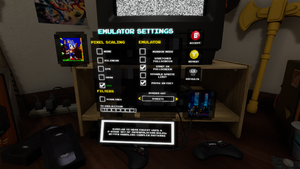 See Helix Mod: SEGA Mega Drive & Genesis Classics. The inability to disable the controller affects Alien Storm. 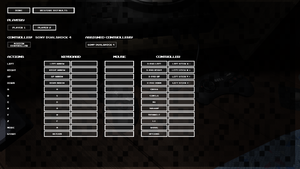 The second controller must be disabled to access one of the game modes. ↑ 2.0 2.1 File/folder structure within this directory reflects the path(s) listed for Windows and/or Steam game data (use Wine regedit to access Windows registry paths). Games with Steam Cloud support may store data in ~/.steam/steam/userdata/<user-id>/34270/ in addition to or instead of this directory. The app ID (34270) may differ in some cases. Treat backslashes as forward slashes. See the glossary page for details. This page was last edited on 14 March 2019, at 07:53.